The infamous “Denkinger call” from game six of the 1985 World Series is a heated topic for fans of both the Royals and the Cardinals. It boils the blood of St. Louis fans, and turns Royals fans defensive while arguing the Cardinals had ample opportunity to win game six, not to mention game seven. Both sides view is clouded by emotions. But there is a way to objectively quantify the effect the call had on the game: win expectancy (WE). Some ingenious baseball nerds fans have mined the data of play-by-play accounts from a huge number of baseball games to determine the percentage of time teams win in every game situation (inning, score, outs, and base runners). Viewing the Denkinger call through the perspective of win expectancy provides a new way to look at a very old argument. The scene: October 26, 1985, Royals Stadium, Cardinals leading the Series 3-2, leading the game 1-0, bottom of the ninth, nobody on, nobody out. Win expectancy tells us that the team with the 1-0 lead at this point in a game wins 81% of the time. Jorge Orta comes off the bench and digs in against Todd Worrell, also taking the field for the first time in the game. Worrell jumps ahead to a 0-2 count. Orta fouls off the next pitch before bouncing one to the right side. Worrell covers first and Orta is out by a country mile…but first base ump Don Denkinger calls him safe. Cardinals up 1-0, bottom of the ninth, man on first, no outs: The Cardinals win expectancy dropped to 67%, a change of 14%. But what if Denkinger got the call right? The Cards would have been just two outs away, with no runners to worry about. And their win expectancy would have jumped to 89%, an increase of 8%. The swing between “out” and “safe” was 22%. So what does that mean for Cardinals and Royals fans? Perhaps it means they are both right. There is a significant difference between an 89% WE and a 67% WE. The blown call clearly had an effect on the game, and Cardinals fans are right to loathe it. On the other hand, that the Cardinals had a 67% WE even after the call means that it was still their game to lose. The players determined the outcome from there. It was only when the batter after Orta, Steve Balboni singled, advancing Orta to second, that the WE swung ever so slightly in the Royals favor (52%). And when the next batter, Jim Sundberg, bunted and Worrell threw Orta out at third, the WE again stood in the Cardinals favor (66%)—once again, the Cardinals game to lose. A passed ball by Darrell Porter that allowed the runners on first and second to advance a base put things back slightly in the Royals favor (55%). An intentional walk to Hal McRae had a nominal effect on the WE before Dane Iorg became the hero with a walk-off single. Many plays involving many players determined the outcome after the Denkinger call. Not to mention that the Cards and Royals played game seven the next night, both with a WE of 50% before the first pitch. But then again…I’m a Royals fan. Aaron Stilley does the blog thing here and makes the tweet tweets here. Loved the analysis, Aaron. Even if it brought back some awful memories. You have proved an old rule of baseball, you cannot give any team four outs in an inning. I wonder how game seven would have been different with another umpire behind home plate. As a Cardinals fan, I think I have more problem with that than “the call”. I think the baseball gods knew the Royals needed a hand…’85 has had to sustain us for 25 years and counting. Hey Bob, this comment is a day late and a dollar short, but I just wanted to reply to your Game 7 thoughts. Do you think a different umpire would have made a difference in the 11-0 score? Would a different umpire have prevented Bret Saberhagen from throwing a complete-game shutout? Or kept George Brett from having four hits? My memories of the game (and I’d love to see it again to see how close this tracks with reality) are that Tudor wasn’t getting the strikes called on the corners like he normally did. It could be as simple as a lefty vs righty thing where the umpire was setting up, but something got under Tudor’s skin. It was very uncommon for Tudor to walk 4 in a game – only did it 3 times in ’85. A +3 K/BB ratio. He’d only walked 6 in the 5 previous postseason games, so something wasn’t right. Could be that Tudor was having a bad day, but it could just as easily been a bit of carryover from the night before from Denkinger (we Cards fans prefer the latter). It’s hard to say how that game would have played out if Tudor had gotten more calls in his favor. Maybe he doesn’t groove the ball to Motley and he probably doesn’t get lit up in the third inning. Bill Campbell and Jeff Lahti don’t come into the game – maybe things are a lot different. Saberhagen pitched a monster game in his first appearance – can’t take anything away from that. From the 3rd inning on in Game 7, the Cardinals just gave up and rolled over. Unfortunate, but true. Not one of their better moments in club history. The brain washing of Cardinals’ fans has resulted in most fans today falsely believing that the infamous call happened with two outs in the ninth rather than with zero outs. Bob N., you remind us of the rule that you cannot give a team 4 outs, but it is important to remember that the game ended with only one out in the ninth (or only two of the four outs if you include the Orta out). I saw an interview of Jack Clark a few years ago that still makes my blood boil. He completely blamed the series on Denkinger in a way that perpetuates what most Cards fans falsely remember: that the Orta out would have been the third out of the inning. Clark never mentioned (at least in the edited version shown on TV) that he dropped an easy pop up in foul territory from Balboni. 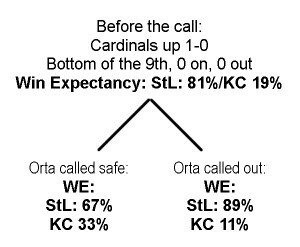 Aaron indicates that the WE increased from 19% to 33% after the Orta call (increase of 14%), but up to 52% after Balboni’s subsequent single (an increase of 19%). If you are looking for someone to blame then look no further than Clark and Porter (or as I would prefer, Iorg). You are right, Rob. I should have generalized that to “an extra out”. And it applies equally to Clark’s failure on the Balboni foul ball, perhaps even more so. We saw the same thing last fall when Matt Holliday failed to make a routine catch. Bad things always seem to follow a defensive miscue, or in the case of ’85, miscue(s). My daughter loved the book, A Series of Unfortunate Events. I always thought that should have been about the ’85 World Series. Very fair assessment. I am a Cardinals fan who has long believed that it is past time for St. Louis fans to put this in the past and just enjoy the fact that a 1985 Cardinal team that was projected at the beginning of the year to finish last, far exceeded expectations. There will never be any way to know for certain either way what effect, if any, that this call had on the outcome of Game 6.